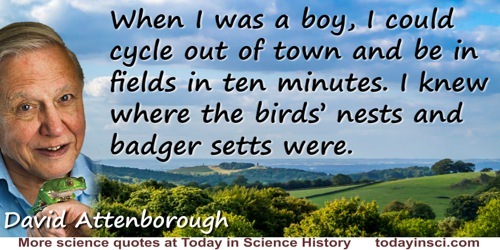 When I was a boy, I could cycle out of town and be in fields in ten minutes. I knew where the birds’ nests and badger setts were. Now children’s mothers would tell them they need someone to go with them, to make sure they weren’t molested by a sexual deviant. Commenting on today’s increased anxiety with health and safety culture. As reported by Adam Lusher in 'Sir David Attenborough', Daily Mail (28 Feb 2014).